Here's an example where the bids sum to 11. In the picture below, all players have bid, and I am the first to lead a trick. What card should I play to start? It's probably a good idea to lead with Ace of Hearts. I am a little long in that suit, with 5 cards. It's unlikely that someone is void in hearts, but if they are, they can't trump me on the first trick, so I'm guaranteed that point. It's also plausible to lead with my club. If Tin Man has the Ace of Clubs, he will definitely take the trick. And at the same time, I've created a void in clubs, so I'm ready to trump the next club trick. Should I lead with the King of Diamonds? There is an advantage to doing this. If my partner has the Ace of Diamonds, he may hold back the Ace and let me take the first trick. If I play the King of Diamonds and it is not taken by an opponent's Ace, it is a good sign that my partner has the Ace, and is allowing me to take extra tricks. It may indicate he thinks we can set the opponents. Another possibility is that he feels his hand is weak, and is hoping for support from me. When I first started playing, I came across this exact scenario - I had a single King and I led with it, assuming it would be taken by someone else (I had not counted on taking a trick with it when making my bid). 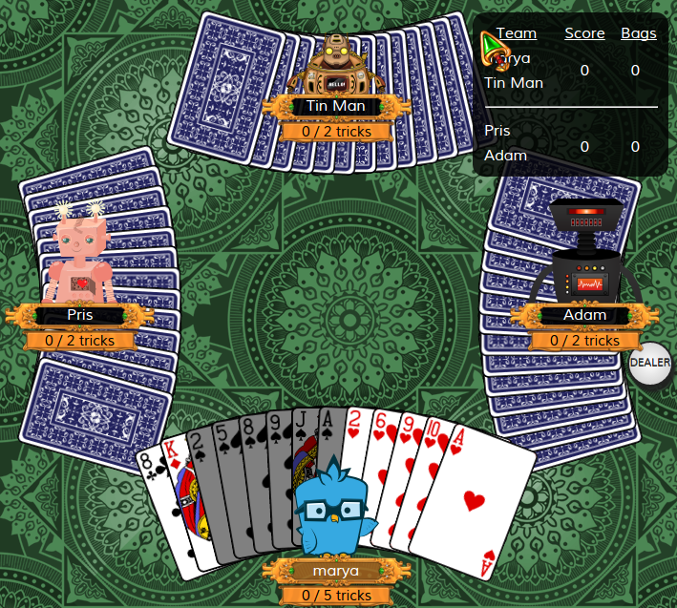 I figured I should flush out the Ace of Diamonds by playing the King on the first trick, where no one can trump. That way, if my partner had the Ace, he would safely take this first diamond trick and I could trump the rest. It turned out that my King was not taken and I won the trick, which surprised me. My partner had the Ace and played a low card to let me take the trick! It just turned out that I had confused him. He played by the rule that you don't trump your partner, especially not your partner's King. I said "But clearly I expected it to be taken, since this was the first card played. I knew the Ace was still in play." He said he just didn't know what I was planning, and so he wasn't going to take the trick away from me. The moral of the story is that you should try not to confuse your partner. Unless you know your partner well, don't expect them to trump your tricks, especially your Aces or Kings.